Most people think of radio as something they listen to at home or in the car, but the underlying technology has many more applications than simply sending and receiving music and speech. Radiotelegraphy-or radio, for short-is also known as "wireless" technology because it is a way of using electricity to send any kind of information between different locations without cables. Currently enjoying a rebirth in cellular phones and wireless Internet, radio was developed a little over a century ago by a young Italian, Guglielmo Marconi. 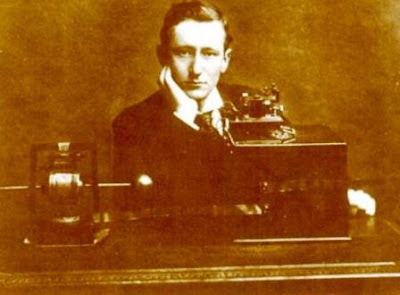 Guglielmo Marconi was born on April 25, 1874, near Bologna, Italy, the second son of wealthy parents. His father, Giuseppe Marconi, was an Italian businessman; his mother, Annie Jameson, came from a wealthy family of Irish distillers (whisky makers). Marconi was dismal at school and, although privately tutored, failed his university entrance exam. Nevertheless, he did take one course of lectures in electricity with an Italian physicist, Vincenzo Rosa, at Livorno, which made a lasting impression. What Marconi lacked in schooling, he more than made up for with home study. He knew about James Clerk Maxwell (1831-1879), an Englishman who in 1873 had shown that electricity and magnetism are really two aspects of the same phenomenon: electromagnetism. Maxwell had proposed that electromagnetism could travel through the air in invisible waves at the speed of light, but he had not proved his proposition at the time of his death in 1879. Heinrich Hertz (1857-1894), a brilliant young German physicist, finally made some of Maxwell's electromagnetic waves (as they came to he known) around 1888, but he died six years later. When news of Hertz's death reachead Italy, Marconi, age 20, read his obituary with interest and was struck by a new thought. Everyone knew messages could be transmitted by a cable using electricity-that was how Samuel Morse's electric telegraph had revolutionized communication in the 1840s. Hertz had shown that electricity could travel through the air. Marconi wondered if he could combine these two ideas to send telegraph messages through the air without using wires. In 1895, he set out to find the answer. The young experimenter had already wired up the family's home, Villa Grifone, so he could flick a switch in one room and ring a bell in another using cables and electromagnets. Next came his experiments with wireless. Like any other form of communication, radio transmission involves sending a message from one place and receiving it elsewhere. Thus, two separate pieces of apparatus are needed a transmitter to "throw" radio waves into the air and a receiver to "catch" them. After successfully sending radio messages across his bedroom, Marconi took the apparatus outside to test it over greater distances. He found he could send messages farther by attaching high antennae to both the transmitter; and the receiver and also by connecting both pieces of apparatus to the ground. He would send a message from the transmitter; and his brother Alphonso, standing some distance away, near the receiver, would raise a flag when he received it. Marconi was soon sending messages more than a mile (1.6 km). Flag signals no longer worked at that distance, so Alphonso had to fire a gun in the air instead. Marconi could see immediately that his invention was more useful than the telegraph because it needed no wires. His mother persuaded him to go to Rome, Italy's capital, to try to interest the government in his new invention. However, the Italian government had just invested a huge sum in a telegraph system and could see no reason for switching to something different. This setback did not discourage the young Marconi; his mother knew many people in England, where much research into electricity was being done, and she sent him to London in 1896. According to one story, British customs officers tried to stop Marconi from bringing his strange bundle of electrical equipment into the country because they thought it was a bomb. Eventually he gained entry and soon met William Preece, the chief engineer of England's post office, who was enthusiastic about Marconi Is ideas. With support from Preece and the British government, Marconi was soon carrying out bolder experiments and sending messages several miles. By 1896, he was so confident about his invention that he decided to apply for a British patent (number GB12039); he called his invention "improvements in transmitting electrical impulses and signals and in apparatus"-in other words, radio. During 1897, he formed his own corporation in London, the Marconi Wireless Telegraph Company, to sell the device. Marconi had already shown that his invention could send messages over land, but communication at sea would really prove its worth. Telegraphs and telephones, which relied on wires, could not send messages to ships. Sea vessels still had to signal with semaphore (using flashlights or flags), which could send messages only as far as people could see. Radio proved an instant success for sending messages between ships and from ship to shore and back; Marconi's company quickly signed contracts with many shipping lines. In 1899, Marconi successfully transmitted radio messages 40 miles (64 km) across the English Channel, the narrow body of water that separates England from France. This impressive stunt proved that radio could be used to link entire countries. The same year, several British warships were fitted with radios, and Marconi demonstrated his invention to the U.S., French, German, and Italian navies. Around this time, a problem with Marconi's system surfaced. Sending messages between one transmitter and one receiver was easy enough. However, if several people tried to send and receive messages at the same time, the signals would mix together. To solve this problem, Marconi came up with a radio that could be "tuned" to different signals. Instead of having every radio send and receive the same waves, Marconi figured out how different radios could be made to transmit signals using radio waves of different lengths. In 1900, Marconi took out a patent on this new innovation, which allowed radio sets to be tuned to different wavelengths. Success followed success. In 1901, Marconi and his assistants carried out their boldest experiment of all. They sent a radio message across the Atlantic Ocean between Poldhu, Cornwall, in the southwest of England, and St. John's, Newfoundland, Canada-a distance of 2,099 miles (3,378 km). Because radio waves travel in straight lines, many people thought sending messages that far would be impossible-surely the waves would simply leave the earth's curved surface and fly off into space. Marconi's remarkable experiment showed that radio waves could travel between distant places on the earth. (Physicists later discovered that these transmissions were possible because the waves bounced off a part of the atmosphere, called the ionosphere, like light reflecting back from a mirror.) Marconi's achievement was so astonishing that many refused to believe it had happened. Alexander Graham Bell, inventor of the telephone, said: "I doubt Marconi did that. It's an impossibility." Every year brought more success for the brilliant Italian. His wireless company made him wealthy. In 1909 he was granted the world's most prestigious science award, the Nobel Prize in Physics. That same year, the ship Republic collided with another vessel in the Atlantic Ocean; the crew used the ship's radio to call for help and virtually all on board were rescued. Three years later, the Titanic disaster was compounded partly because the nearest vessel, the Californian, had its radio switched off; 1,500 lost their lives. In 1912 Marconi was caught up in a business scandal when the British prime minister, David Lloyd George, was accused of wrongfully trading in shares in Marconi's company. The same year, Marconi lost an eye in an automobile accident. This misfortune did not stop Marconi from taking part in World War I (1914-1918), first in the Italian army, and later in the navy. In 1919, he was a delegate to the peace conference at Versailles, France, that formally ended the war. The Italian government soon made him a marchese (marquis) in recognition of his achievements. Marconi became very interested in politics, serving as scientific adviser to the Italian leader Benito Mussolini and becoming a senator in 1929. Being a senator automatically made him a member of Italy’s Fascist Grand Council. Marconi was proud to support fascism (the violent political movement that brought to power Hitler in Germany and Mussolini in Italy) even as its brutality began to unfold in the years leading up to World War II. Whatever his other interests, radio was never far from Marconi’s mind. During World War I, he had begun to experiment with radio waves of shorter lengths. Unlike the long waves Marconi had used until then, shortwaves could be broadcast with smaller and less sophisticated equipment. Marconi continued this work through the 1920s and 1930s. Around the same time, he developed a way of sending telephone calls with microwaves (very short'wavelength radio waves)-a technology now used in cell phones. The pope became one of the first to use this device, in 1932, when Marconi set up a link between the Vatican and Castel Gandolfo, the pope’s summer palace. Marconi died on July 20, 1937, age 63. and was buried in a mausoleum at the family home. As a tribute, radio stations throughout the world fell silent for two minutes. When American inventor Lee De Forest (1873-1961) developed the audion (or triode) valve in 1906, the huge and cumbersome early radios suddenly became smaller and more affordable. The golden age of radio began with a broadcast from New York’s Metropolitan Opera in 1910 and continued until the 1950s. Many people think television killed off radio at this time, but television was really just radio in a different guise-until the invention of satellite and cable, all televisions received pictures carried through the air by radio waves. Far from falling in popularity, wireless radio has become more important than ever, lying at the heart of cellular phones and making possible one of the latest wireless technologies, WiFi (Wireless Fidelity), a convenient way of connecting computers to the Internet without cables. Just how much of the “wireless revolution” should be credited to Marconi is a matter of debate. He did not discover electromagnetism or radio waves; nor did he carry out the ﬁrst radio experiments. England’s Sir Oliver Lodge (1851-1940) sent a message by radio waves on August 14, 1894. several months before Marconi. Lodge also patented radio tuning in 1897, three years before Marconi. At first, Lodge accused Marconi of “inventing nothing and borrowing everything else,” but he later sold his patent to the Italian and played down their rivalry. However, Lodge was not alone. A distinguished Russian scientist, Aleksandr Popov (1859-1906), also claimed to have made important discoveries about radio in 1895, prior to Marconi. In the United States, Nikola Tesla (1856-1943), a Russian-born physicist, was granted the ﬁrst patent on radio in 1900. As a result, when Marconi tried to patent his radio inventions. his applications were repeatedly refused. Then. in 1904, the US. Patent Ofﬁce reversed itself and awarded the patent for the radio to Marconi. This led to a long dispute between the two inventors until, in 1943, shortly after Tesla's death, the US. Supreme Court overturned Marconi's patent and credited the invention to the Russian. This dispute demonstrates that great inventions are often the work of many people. Marconi believed the scientists who said radio waves could travel through the air. However. he disbelieved those who said radio signals could not bounce around the earth from country to country. Some of his success was attributable to his genius for publicity-for staging big, bold stunts. such as sending radio signals across the oceans. His real contribuotion was to take the complicated scientific discoveries of Maxwell and Hertz and turn them into a practical working technology that has become one of the most useful forms of communication ever developed.